Table by ?John Robins (1776-1828), early nineteenth century, probably c.1834-35. ©Sir John Soane's Museum, London. Photograph: Hugh Kelly. Rectangular wooden frame with four turned legs on castors to which a wooden portfolio for drawings, reeded around the bottom edge and the edge of the lid, has been screwed; the portfolio has an ivory disk inscribed M above the brass keyhole and a brass strut support for the lid, which has been re-hinged and has a modern lock plate; holes in the side indicate that at some time this box had brass bail handles. This somewhat makeshift piece of furniture is a further example of Soane creating places in almost every part of his Museum in which he could work if necessary and where drawings or books could be stored. It is shown in Figure 62 next to the table cat. 91 in the centre of the room. 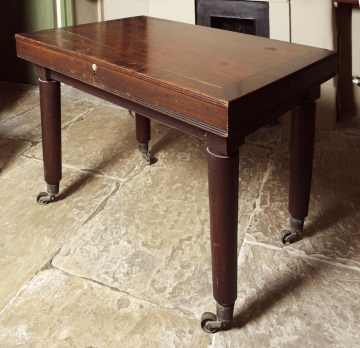 It is described in the 1837 inventory as ‘A Mahogany Box (marked M) placed on a frame with four turned legs, as a Table, 3’5” by 2’4 ½”’. The plain turned legs are rather chunky and very similar to those on the dining room chairs (cats 21-28) and the writing table (cat. 37), which are known to have been made by Robins. Soane kept the drawings for the Branch Banks of the Bank of England in this table. However, the 1837 Furniture and Fittings inventory does not list any chairs in this room – none accompany the tables in the Picture Room or Apollo Recess either – and we must assume that chairs were brought by servants if needed. This piece was dismantled after Soane’s death and the box removed to the Student’s Room whilst the frame was used to support a cork model. The table was reassembled and replaced in the Basement Ante Room in 2006.